The mining industry in this parish has passed through many vicissitudes. In the northern part of the parish coal and ironstone were worked in the latter part of the 18th century. Shale has been worked more or less continuously since about 1870. Climpy Mine - situated near Forth and Wilsontown, and at an elevation of 1020 feet O.D. The villages of Forth and Wilsontown were recently formed into a special water supply district, but the water supply has not yet been introduced, although works are being proceeded with. Most of the houses in Forth are privately owned. They are almost all ancient construction and have a small valuation. The houses in Wilsontown are mostly owned by the mining company. Eight privy middens with 13 doors. Some privies without doors. Water supply from spring some distance off, gravitation water supply (for special district) under construction. There are also rain-water barrels for each house. Many of the houses are not in a good state of repair, but the owners are about to carry out improvements and provide better sanitary conveniences. Three privy middens, with six seats, at rear of dwellings. The privies are brick built with doors. One sink for every two houses placed in front of the houses, connected with underground drainage system. 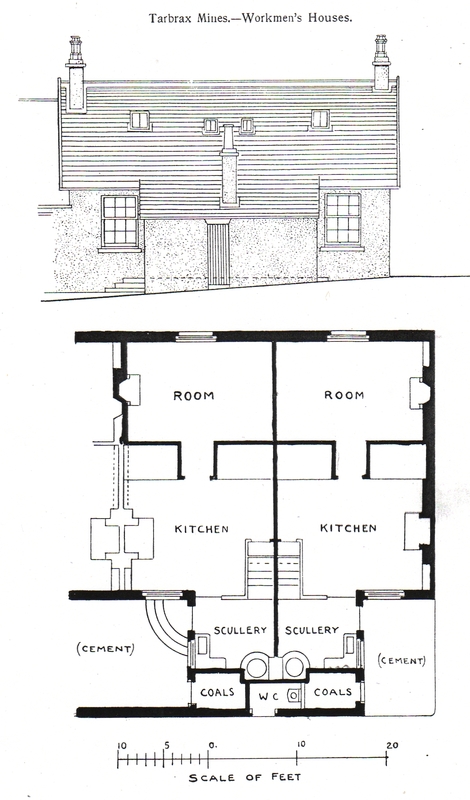 Five pail privies are situated to the rear, on sloping ground beneath the wash-house. These privies are kept in excellent order, but the occupiers require to empty the pails into the ashpit, which is also situated to the rear. The surface of the ground at the front of the houses requires finishing off. No slop sinks or proper drainage. Glenview - 50 yards or more beyond last house in Rootpark. A two storey tenement, privately owned. Some of the tenants work at Wilsontown Mine, and some at Climpy Mine. Tarbrax Shale Mine - situated between Cobbinshaw and Auchengray Stations, distant about 2 miles from Woolfords, and at an elevation of about 900 feet O.D. Tarbrax - This village contains 241 houses, owned by the Tarbrax Oil Company. They are occupied mainly by persons engaged at Tarbrax Shale Mine, but there are a few workmen from Woolfords Coal Mine. The houses may be divided into two groups. Those erected many years ago by a former company, when shale mining was commenced, numbering 121, and those erected in 1905 by the present company, numbering 120. The old houses have been greatly improved in construction, and have been provided with modern domestic and sanitary conveniences. Thus almost all one-apartment houses were converted into two apartment houses. 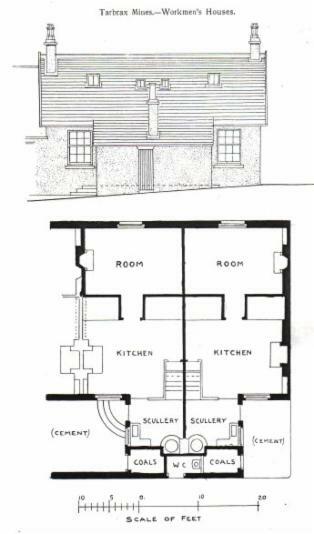 The privy middens were abolished, and water closets provided in the proportion of one for every two houses, placed in an annex to the dwellings, where there is also a combined scullery and wash-house, with gravitation water supply. The external walls have been rough cast. The internal walls are strapped and lathed. The drains were all reconstructed, with a sewage outfall on to an irrigation field. The houses were reoccupied towards the close of 1905. The old houses are partly in two storey blocks and partly in one storey rows. 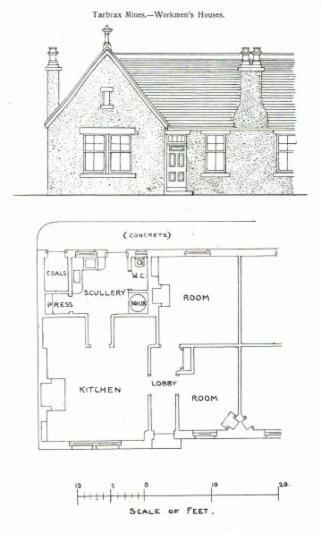 They may be classified according to rental as follows:- 10 one apartment and scullery, rental, £5 4s; 37 two apartments and scullery, rental, £7 3s; 56 two apartments and scullery, rental £7 16s; and 18 two apartments and scullery, rental, £8 4s 8d. The rentals include occupiers' rates and taxes. The new houses, built since 1905 under the Building Bye-laws, number 120. 118 are of two apartments, rental £10 8s; 2 four apartments, rental, £12 2s8d, includes occupiers' rates and taxes. 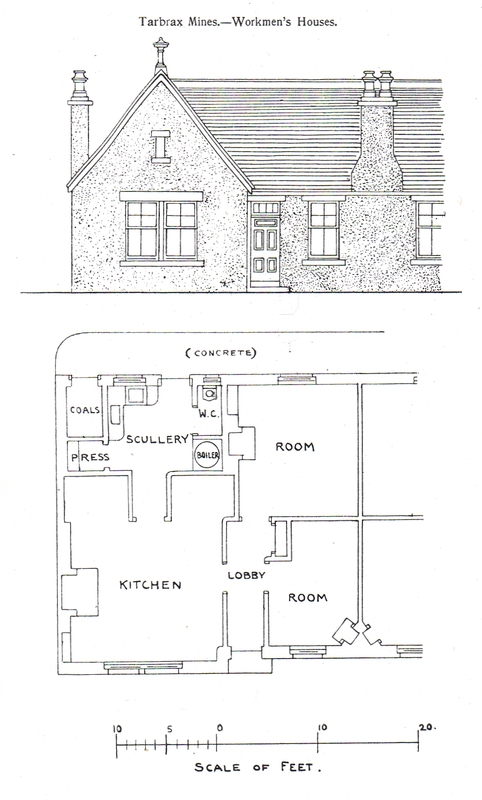 Each house is provided with a combined scullery and wash-house - walls strapped and lathed - floors wood, ventilated - internal surfaces of walls and ceilings in good condition. Water closets for every two houses except in one lot, where there is a closet for every house.